May 13th-May 19th Weekly Giveaway WINNERS! Monkey Doodlez Products 35% Off!! Babylegs of the Month Winner! The winner of this week's giveaway is Roshelle! You've won an indigo Moby Wrap!! All Items of the Week run from Wednesday through the following Wednesday Wednesdays are Double Deal Days! Congratulations to Heidi J, Lynn F and katherina-thea! 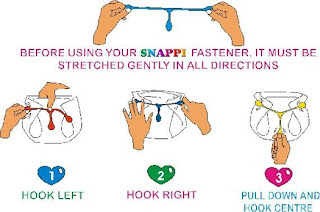 You each win a Snappi Cloth Diaper Fastener! 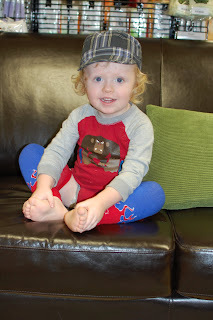 Please email annie@nickisdiapers.com within one week to claim your prize! Our last giveaway of a Moby Wrap was such a hit that we thought we'd do it AGAIN!! 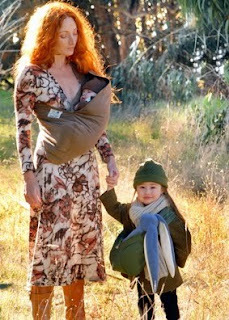 The Moby Wrap is one of the most comfortable baby carriers on the market! The design uses your entire back, as well as your shoulders to carry the weight of your baby. Unlike other carriers which have narrow straps and may only go across one shouder, the Moby Wrap is a wide stretchy piece of fabric that is wrapped over both shoulders. 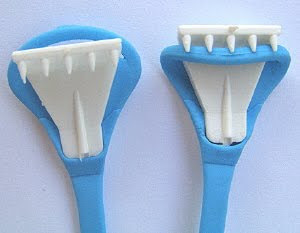 It is super comfortable and very easy to wear. There are no buckles, snaps or other fasteners. It is easy to adjust the fit by varying how tightly you wrap yourself and your baby. The Moby Wrap is very versatile! You can wear your Moby Wrap in many different ways. Wear your baby facing you or facing the world. When not being used as a carrier you can use your Moby as a blanket, pillow, or anything else that comes to mind. Kissaluvs Fitted Diaper - 5% OFF!!!!! All "Items of the Week" run from Wednesday to Wednesday. Snappi Diaper Fasteners work best with terry cloth diapers, cotton prefolds (Chinese or DSQ), and other cloth diapers with a loose enough weave for the Snappi to hook into. They do not work well with flannel or any other tightly woven cloth diapers, even most hemp clothdiapers. Congratulations to C's Mommy! 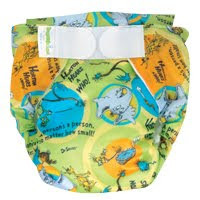 You are the winner of a Bumkins AIO Cloth Diaper in size medium, Green Horton! We've just marked down a few products at Nicki's Diapers and we want you to know about these great deals! Check them out! New Native Baby Carrier - $5.00 OFF!!!!! We've got a GREAT sale going on now that you don't want to miss out on! ALL Monkey Doodlez products are 35% off with FREE Shipping!! Chose from their high-quality and super absorbent AIO diapers starting at $12.35 (available in Original, Micro and Bamboo), Wipes Cubes, wipes, wet bags, pail liners, Pail Pals and Doodlez Stay-Dry Doublers. Visit our sister site, www.myswimbaby.com and check out Monkey Doodlez Swim Diapers, also 35% off with FREE shipping! Visit our site for a full selection of colors and sizes and to see a detailed list of Hurry, with prices like this, inventory is going fast! 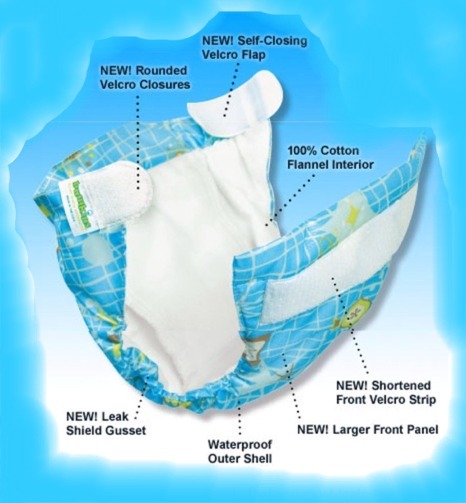 The Bumkins All In One Diaper has a unique waterproof shell exterior that stay soft without breaking down in the wash. This AIO is designed with an airflow panel for easier laundering and quick drying. The sturdy Velcro closures allow for a quick and adjustable fit including fold-back tabs for easy washing. With the Bumkins All-In-One Diaper you get to enjoy the convenience of a disposable diaper with all the benefits of cloth diapers. This AIO is one of the most popular AIO cloth diaper on the market! An added bonus is this cloth diaper is PVC free. The Bumkins All In One Diaper is available in white and in an assortment of super cute prints including Dr. Suess prints! This AIO is machine washable. Congratulations to Kassy and Nisha! 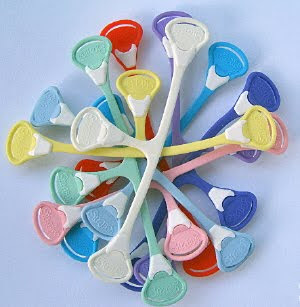 You each win a Gro Baby Bio Soaker Intro Package in your choice of size! Please email annie@nickisdiapers.com within 1 week to claim your prize! Planet Wise Changing Pad - 10 OFF!!! How cute and charming is this little guy?! 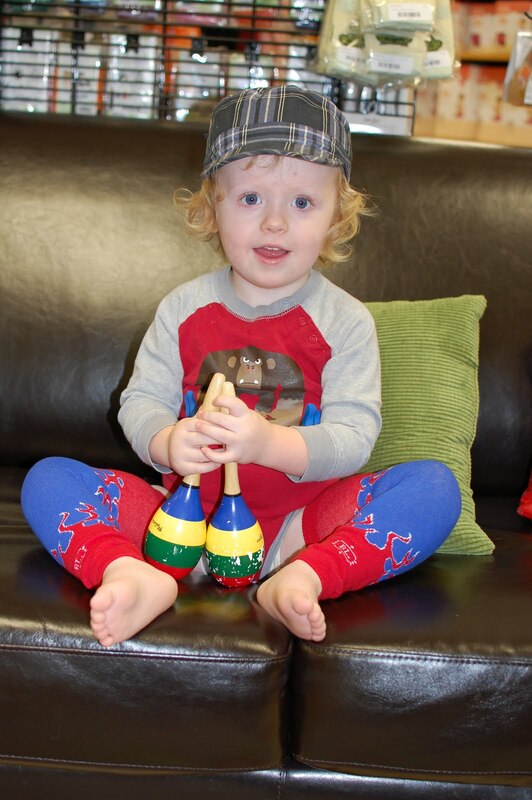 Thanks for coming in to visit with us, Beau! Your smile is contagious! Occupation: I taught 3rd grade at Lannon Elementary School in Sussex, WI for eight years before becoming a full-time mom last year. Child: Sierra is our daughter and she'll be one on May 25! How did you decide to cloth diaper? I was inspired by my good friend, Amy, and my sister-in-law, Kelly. They both used CDs and made it more modern than the 70s version I had always imagined it was. I feel good about saving money, but my primary reason is environmental. I'm hoping to do my part in my little corner of the world, and hoping that others will be inspired by me, too. What types of cloth diapers do you use? We have a wonderful mix of brands, but use one-size pocket diapers almost exclusively. What is your favorite non-mommy related activity or hobby? We love ttraveling and hiking, especially out West. Fortunately, we can cart Sierra around with us right now. Other guilty pleasures: watching "Chuck" episodes online (we always miss it on TV) and catching up with "Chelsea Lately" or "The Daily Show" if I'm not reading in bed. What type of music do you play in the car when you don't have your child? Sierra listens to whatever we have on, so when I'm alone, I indulge in NPR. What would you tell someone who is just starting out? Its not as crazy as most people think it is! Be sure to ask lots of questions, both from people who have used CD, and the staff at Nicki's. Everyone wants to make it as easy as possible - we're all Moms, after all.